My father was an early adopter of the Internet, so it came as no surprise when, at the age of 72, he asked about Twitter. He is assisting an organization of jazz supporters and fans in Milwaukee, and Twitter seems a useful tool for raising awareness. But while launching a profile (@JazzMKE) and tweeting are simple enough, the nuances of microblogging were not as easily grasped by a guy who still carries a thick paper calendar with him wherever he goes. I considered sending him links to blog posts that were my most popular ever--a four-part series that began with Twitter 101, Part 1: What Twitter is and ended with Twitter 101, Part 4: Tips for Being Successful on Twitter. I realized, however, that these lengthy blog posts were crammed with more information than was needed by a person who just wants the essentials. My dad needs to know how to see replies and find followers, not how to establish his Social Media persona. A Tweet is a message directed to no one in particular, and everyone sees it. Simply type the message in the "What are you doing?" box at the top of Twitter, click "Update," and everyone who follows you will see the message. Tweets posted by the people you follow will be visible on your Twitter home page. Every tweet created by a person you follow will appear in reverse chronological order on your home page at http://twitter.com/. As you amass followers and want to do a better job of tracking tweets, there are many free tools you may use to monitor Twitter, but using Twitter.com itself is a fine place to start until you get the hang of it. 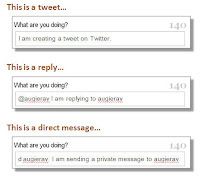 Replies: If someone sends you a reply, you may see it on your Twitter.com home page. Remember, @replies are publicly viewable messages and are not private, so they appear on your home page just like any other tweet. Of course, unless you monitor your Twitter home page constantly, you may miss that someone replied or directed a message to you. Depending upon how many people you follow and how often they tweet, it's very possible for you to miss an @reply because it is hiding on page two (or page 20) the next time you sign in. Luckily, Twitter has an easy solution--just look on the right side of the home page for a link that is your username preceded by the "@" symbol. This will take you to a list of tweets that were directed to you or that mention you. Someone may be asking you a question and is awaiting your answer. Someone may be commenting on something you said, so you might want to know and consider a response. Direct Messages sent to you can be found by clicking the "Direct Messages" link on the right side of the home page. You can also see a count of the DMs you received beside that link. LESSON THREE: Finding people to follow: This is both easy and complex, depending upon how assertive you wish to be in creating a list of followers. There are dozens of tools and sites to help you grow your Twitter list, but here are four simple ways to find new, appropriate, and interesting people to follow on Twitter. The easiest way is to follow the new people who follow you. As people find and follow you on Twitter, you'll get alerted via email. You can also see a list of your followers by clicking the small "followers" link that appears beneath your count of followers at the top right corner of your Twitter page. On that page, you can easily see who you are already following and who you are not, and following them can be accomplished with a click of the mouse button. You can also find followers by following the people who are followed by the people you follow. That sounds complex, but it isn't. For example, if you find someone particularly interesting on Twitter, you may wonder who they find interesting. Just go to their home page and click on the "following" link at the top right corner of their Twitter page. You can click the "follow" button next to the people listed on another person's followers page, which adds these folks to your own follow list. Searching for followers: There are several ways to seek out followers with interests similar to your own. For example, you can search Twitter; to do so, click "Find People" at the top of your Twitter page and search for people you know. You could also go to Twellow.com and search for terms of interest (such as "Disney," "Jazz" or "Social Media") to find Twitter users who mention those terms in their Twitter profiles. Use a tool to find followers: There are many sites and tools that promise to hook you up with like-minded Twitterers. Some of these tools are based on the idea of Twitter communities, where people can self-identify their areas of interest. For example, if you're interested in photography, you can find lists of people to follow at http://wefollow.com/twitter/photography or http://www.twibes.com/group/photography. Another category of follower-finding tool will analyze your profile and tweets and then make recommendations of people to follow. For example, check out http://whoshouldifollow.com/ or http://mrtweet.com/. As you gain comfort with Twitter, there are a huge variety of tools and software you can use to do everything from vetting followers to scheduling tweets to categorizing followers to shortening Web links so they'll more easily fit into the 140-character Twitter limit. But before jumping into the deep end of the Twitter pool, start by wading for a while until you're acclimated to the new waters. Love it! I am one of the "oldies" and I appreciate learning all I can to stay current. Thanks! K.N.